Jim Falconer, Art Green, Gladys Nilsson, Jim Nutt, Suellen Rocca, and Karl Wirsum. Hairy Who, 1966. The Art Institute of Chicago, gift of Gladys Nilsson and Jim Nutt. Courtesy of the Art Institute of Chicago. The New York Times fall art preview was recently released, listing more than 100 noteworthy shows to see this fall including many shows with SAIC alums. For the month of September, the Times recommends the show Soul of a Nation: Art in the Age of Black Power, which features AfriCOBRA artists Gerald Williams (BFA 1951), Jeff Donaldson, Jae Jarrell (SAIC 1959–62), Wadsworth Jarrell (SAIC 1958), and Barbara Jones-Hogu (BFA 1964) among others at the Brooklyn Museum of Art. 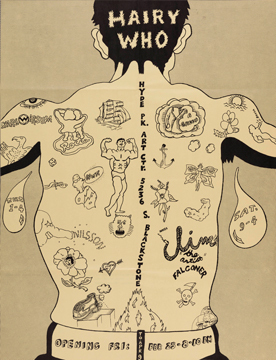 Also opening in September is the Hairy Who: 1966–1969 at the Art Institute of Chicago, which presents the work of six SAIC alums, Jim Nutt (BFA 1967, HON 2016), Art Green (BFA 1965, HON 2016) , Suellen Rocca (BFA 1964, HON 2016), Jim Falconer (BFA 1965, HON 2016), Gladys Nilsson (BFA 1962, HON 2016), and Karl Wirsum (BFA 1962, HON 2016), whose work the Times refers to as "gleefully uncool." While in October, Sterling Ruby's (BFA 2002) exhibit Ceramics opens in October at the Museum of Arts and Design. The retrospective of Charles White (SAIC 1937–38) travels to the Museum of Modern Art, an exhibit the Times calls "an unmissable survey of this uncompromising African-American painter and printer." Rounding out the fall season in November is the show West by Midwest, which traces the Midwest connections of West Coast artists. The exhibit, which opens on November 17 at the Museum of Contemporary Art Chicago, features several SAIC alums including Judy Chicago (HON 2018), Jessica Jackson Hutchins (Post-Bac 1997, MFA 1999), Gladys Nilsson (BFA 1962, HON 2016), Jim Nutt (BFA 1967, HON 2016), Amanda Ross-Ho (BFA 1998), Sterling Ruby (BFA 2002), Charles White (SAIC 1937–38), Karl Wirsum (BFA 1962, HON 2016), and Kori Newkirk (BFA 1993). Judy Chicago's show A Reckoning at the Institute of Contemporary Art, Miami, was also selected for this list of not-to-be-missed shows. Read the full list here.